Go to original pattern for design DROPS 164-19. 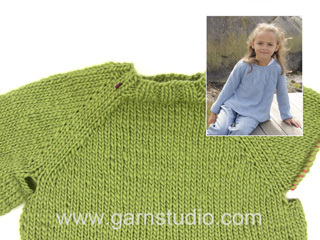 Knitted DROPS jumper with Nordic pattern, round yoke, high collar and rib, worked top down in 2 strands ”Brushed Alpaca Silk” or 1 strand ”Melody”. Size: S - XXXL. 25 g for all sizes in colour no 02, light grey. DROPS DOUBLE POINTED NEEDLES and CIRCULAR NEEDLE (40 and 80 cm) SIZE 6 mm - or size needed to get 13 sts x 17 rows in stocking st with 2 strands ”Brushed Alpaca Silk” or 1 strand ”Melody” = 10 x 10 cm. DROPS DOUBLE POINTED NEEDLES and CIRCULAR NEEDLE (40 and 80 cm) SIZE 5.5 mm - for rib. 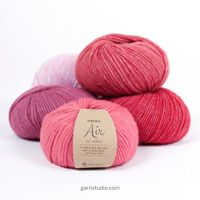 You can get the yarn to make this pattern from	23.40£. Read more. Use yarn from both inside and outside of the ball. When switching to a new ball, try to avoid switching both strands at the same time - to avoid a thick yarn when fastening. See diagrams A.1-A.2. Work all pattern sts in stocking st with 2 strands Brushed Alpaca Silk (= BAS) or 1 strand Melody (= M). Work until 3 sts remain before marker, K 2 tog, 2 sts in stocking st (marker is in the middle of these 2 sts), slip 1 st as if to K, K 1, psso (= 2 sts dec). Inc alternately before and after marker. Inc as follows before marker: Work until 1 st before marker, 1 YO. Inc as follows after marker: 1 st in stocking st, 1 YO. On next round K YO twisted (i.e. work in the back loop of st instead of front) to avoid holes. 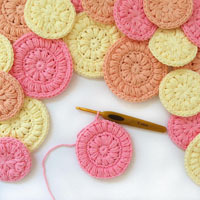 Work in the round on circular needle, top down - READ DOUBLE YARN TIP. Rounds beg = mid back. Now continue as follows: Work the first 24-27-29-33-37-40 sts (= half back piece), slip the next 46-48-50-52-54-56 sts on a stitch holder (= sleeve), cast on 6 new sts under sleeve, work the next 48-54-59-67-75-81 sts (= front piece), slip the next 46-48-50-52-54-56 sts on a stitch holder (= sleeve), cast on 6 new sts under sleeve, work the remaining 24-27-30-34-38-41 sts on round (= half back piece). Piece measures approx. 20-21-22-23-24-25 cm. There are now 108-120-130-146-162-174 sts for body. Insert a marker in each side of body where new sts were cast on under sleeves (= 3 new sts on each side of marker). NOW MEASURE THE PIECE FROM HERE. Now work 1-1-2-2-2-3 rounds with grey (2 strands Brushed Alpaca Silk/ 1 strand Melody), AT THE SAME TIME on last round adjust no of sts to 108-120-132-144-168-180 sts. 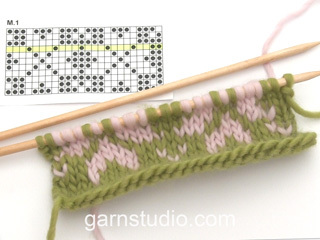 Now work pattern A.1 (= 12 sts) 9-10-11-12-14-15 times in width - READ KNITTING TIP. When entire A.1 has been worked vertically, continue with A.2 (= 8 sts) over all sts and inc 4-8-4-8-8-4 sts on 1st round in diagram = 112-128-136-152-176-184 sts. When entire A.2 has been worked vertically, piece measures 33-33-34-34-34-35 cm. Now work 1-2-2-2-3-3 rounds in stocking st with grey (2 strands Brushed Alpaca Silk/ 1 strand Melody), AT THE SAME TIME on last round inc 20-20-24-24-28-28 sts evenly = 132-148-160-176-204-212 sts. Now work rib = K 2/P 2 for 3-3-3-4-4-4 cm. Cast off sts with K over K and P over P. Piece measures 56-58-60-62-64-66 cm in total. Work sleeve in the round on circular needle/double pointed needles. There are 46-48-50-52-54-56 sts for each sleeve. Slip sts from stitch holder back on circular needle/double pointed needles size 6 mm and cast on 6 new sts under sleeve = 52-54-56-58-60-62 sts. Insert a marker in the middle of these new sts (i.e. 3 new sts on each side of marker). NOTE: This is beg of round. Work with grey (2 strands Brushed Alpaca Silk/ 1 strand Melody) as follows: Work the first 25-26-27-28-29-30 sts, insert a marker in next st, work the remaining 26-27-28-29-30-31 sts. 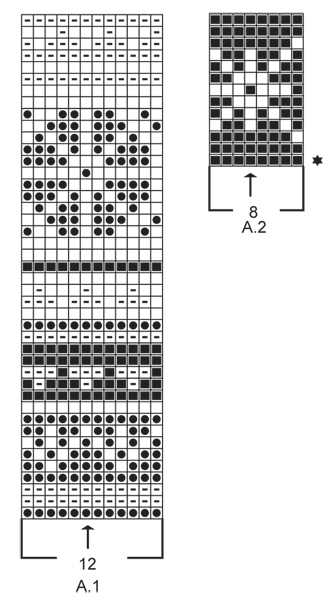 On next round, work pattern A.1 (= 12 sts). NOTE: Adjust so that the 7th st in diagram (see arrow) fits with st with marker in the middle of sleeve. I.e. pattern repetition does not fit under sleeve but work pattern over all sts on sleeve and the pattern will then be symmetrical under sleeve. When piece measures 3 cm, dec 1 st on each side of marker under sleeve - READ DECREASE TIP. Repeat dec every 3-2½-2½-2½-2½-2½ cm 10-11-11-11-12-12 more times = 30-30-32-34-34-36 sts. When A.1 has been worked vertically, continue with A.2. NOTE: Adjust so that the 5th st in diagram (see arrow) fits with st with marker in the middle of sleeve. I.e. pattern repetition does not fit under sleeve but work pattern over all sts on sleeve. 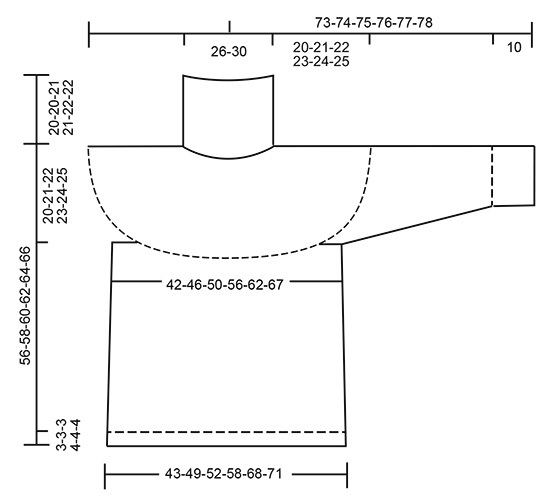 When A.2 has been worked vertically the sleeve measures 33 cm in all sizes. Now continue with grey (2 strands Brushed Alpaca Silk/ 1 strand Melody) until finished measurements. Work 3-3-3-2-2-2 rounds in stocking st, AT THE SAME TIME on last round inc 2-2-0-2-2-0 sts evenly = 32-32-32-36-36-36 sts. 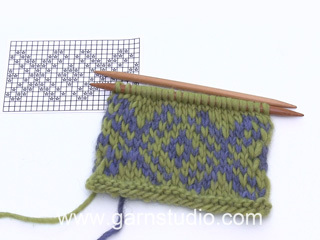 Switch to double pointed needles size 5.5 mm and work rib K 2/P 2 until sleeve measures 45-45-45-44-44-44 cm in total. 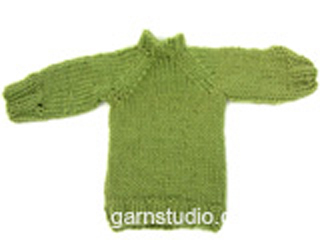 Cast off sts with K over K and P over P. Knit another sleeve the same way. The measurement on neck has been edited, the measurement for neck is after the high neck in rib.